Dining in shorts is in congruent with fine dining, but the proprietor of Cassis believes that one must be relaxed to enjoy food. THE front signage is large but unostentatious; in fact, it is so discreet that, unless you know it’s there, you’ll probably walk straight past it. That’s because Cassis is deliberately designed to be low-key yet classy. 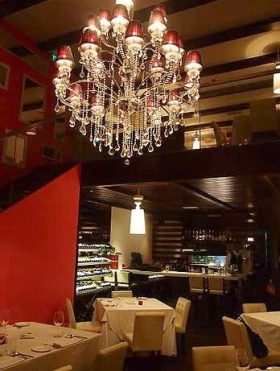 Inside, it displays simple, understated elegance, with pride of place going to an enormous crystal chandelier in the middle of the dining room. 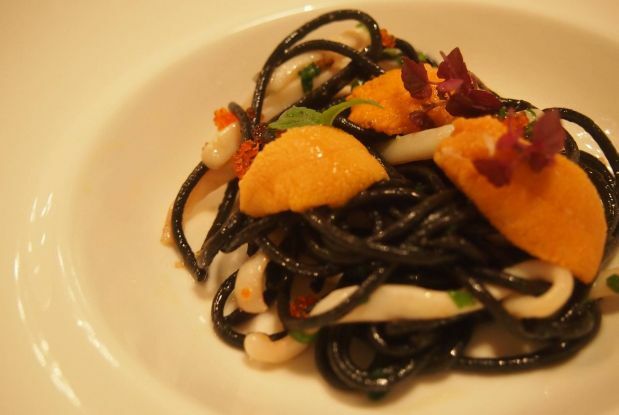 Opened in June last year, the restaurant in Bellisa Row, Pulau Tikus, offers fine dining without all the palaver that one usually associates with the expression. Enigmatic proprietor Beh Weng Chia, 29, who is also the executive chef, believes that to really enjoy food, one must be able to relax, and in order to do that, one must be comfortable in one’s environment. Some might call it arrogance, but it’s a refreshing change to come across a chef who doesn’t feel the need to conform to accepted ideas and conventions, and who doesn’t expect it of his customers either. Chef Weng trained in the United States and gained experience in Europe and Australia where he ran a restaurant in Margaret River, Perth. He returned to Malaysia two years ago. Named for his wife Cassandra, it’s also a play on words; cassis is the French word for blackcurrant, and is meant to imply the type of cuisine served: modern western with a French twist. Actually, it’s more than that. The menus, both a la carte and tasting, change almost weekly (“It makes cooking much more interesting”), and the evening we were there, our tasting menu had quite a Japanese ring to it. “It’s healthy and well accepted in Asia,” he believes. At RM268++ per pax, it’s definitely not your average choo char restaurant, and certainly quite unique for Penang, seeing as we are, ahem, well-known for expecting good returns on the ringgit. The first of our six courses, all bite-sized, was sashimi-style raw fish: translucent kanpachi (young yellowtail) with black winter truffle for me, and blue fin tuna for my dining partner, followed by a fishy but colourful Sea Urchin with Squid and Black Squid Ink Pasta, and a creamy Cauliflower Soup with Foie Gras and Black Truffle, served piping hot. The third course was air-flown Boston Lobster with White Asparagus, cooked to à point perfection – not completely done but not sashimi raw either, according to restaurant manager Kelvin Lim – and Seared Duck Foie Gras with Red Wine Syrup, which was smooth and creamy as butter. You get the drift? The meal continued with a juicy Blackmore Wagyu and a tender Challandaise Duck Breast, after which we finished off with home-made Jasmine Ice Cream and brewed coffee. All this was accompanied by a light Pinot Noir from the Villa Maria Estate in New Zealand. It was fruity and easy on the palate, and is one of the 100+ labels the restaurant carries. 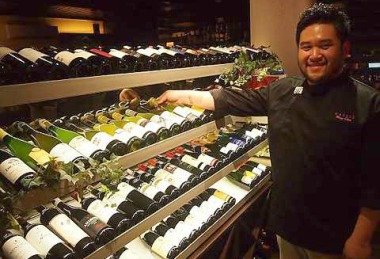 Chef Weng looking proud of Cassis’ large selection of wines. So what has the general reaction been to his restaurant? Having said that, it’s true that many of their well-heeled customers return “because they appreciate our food”. Based on the “it’s-expensive-so-it-must-be-good” concept though, he concedes that there might be an element of snobbery in it. However, Chef Weng believes that no other establishment in Penang offers what they do. Helen Ong blogs at www.helenong.com.